How to use the Editor mode? The editor mode is where the magic happens. This is where you create and edit your widgets; this is the moment to combine aesthetics and efficiency so that your client gets to look at a pleasant yet professional dashboard. Let’s talk about the header first, since it’s the first thing your client sees. We’ll keep the widgets for the second part. 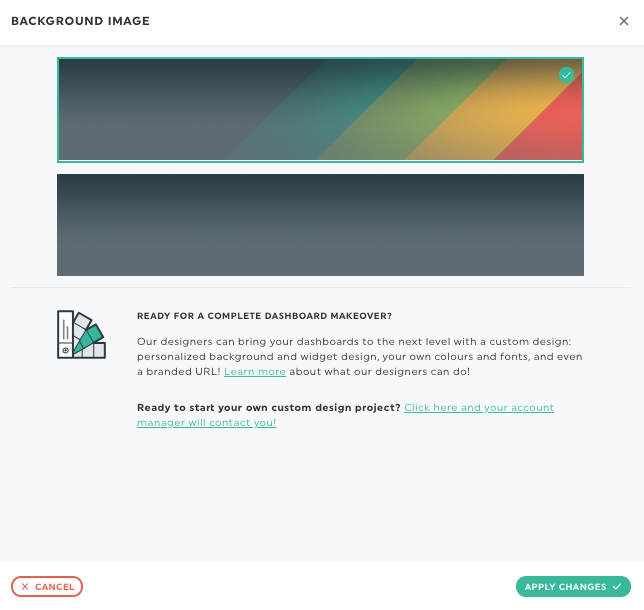 Start your dashboard creation off on the right note, and make it your own: add a title and a logo that matches either your or your client’s brand! When you click on the empty space called “Image size”, a panel appears on the right side of the screen. This is where you can choose the logo you want to add to your dashboard. The logos displayed in the panel are those that were already added to your account. If you want to add a new one, please go to the Logos section. If you already added a logo and you’d like to change it, just hover over the logo, and choose the option Replace Image in the menu located on the right side of the image. Choose a new logo from the panel. In order to have the best-looking logo, its ratio should be 2:1, which means that the image should be twice as long as it is wide. The ideal size is 250 pixels x 125 pixels. If your image doesn’t follow this rule, it will be stretched to fit the box. By default, the header’s background image displays the DashThis colours. You have the option of switching to a neutral, all grey background though. 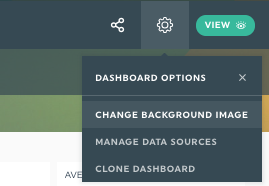 Just click on the dashboard options, and on Change Background Image. A panel appears on the right side of the screen with which you can change the background image. You want to deliver the WOW effect with your dashboard? Our designers can take care of that and create a fully customized design. And now, time to have some fun with the widgets! A widget is the element that displays data. It can be a graph, a comment box, a gauge, etc. The widget creation starts at the top-left corner of the screen, with the three drop-down menus. You can choose between preset, custom, and static widgets. The preset widgets are metrics and/or KPIs that are the most popular for the integration(s) you’ve connected to your dashboard. By default, these will be either historical or list widgets. The custom widgets offer you up to nine widget types to choose from, such as a pie, stacked columns, gauge, or other. We suggest you vary the types of widgets in your dashboard in order to create a diversified and visually appealing layout. You can learn a bit more about the types of widgets you can create in our article here. The static widgets give you the opportunity to add other pieces of information, such as comments, editable numbers, headers, or CSV file widgets to divide your dashboard into sections. Pick the type of widget you want, select the metric (and the dimension and/or segment, if applicable), click Save, et voilà! Your widget is now in your dashboard! Please note that the options available in each drop-down menu will vary depending on the integration(s) in use as well as on the type of dashboard you choose. 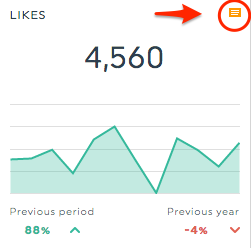 Once a widget is in your dashboard, you can move it around by dragging and dropping it. Just hover over the widget you want to move; when your cursor becomes a 4-way arrow, you’re free to move things around! You can also resize some of your widgets, depending on what type they are. When you hover over the widget, green circles containing white arrows appear on the edges. The arrows will only appear if it’s a type of widget you can resize, and only on the sides you can expand or compress. Remember that moving the widgets around your dashboard could change the resizing options. Hovering over a widget will also make a menu on the right side appear. Note: You would like to give your viewer some additional information about the data displayed in your widget? We got your back covered with the note option! If you add a note to your widget, an orange icon will appear in the top-right corner of the widget when in Viewer mode. The viewer can click on it, and the note will appear on the right side of the screen in a separate panel. Edit widget: If you click here, the Edit widget panel will appear on the right side of the screen. Wanna change an integer for a percentage? Or include both? How about incorporating a markup to your cost widgets? All these options – and more, of course! – are available in this panel. You can read a detailed article on every possibility this panel contains. Refresh data: This option will refresh the data in your widget so that the numbers reflect those from the last daily import. Delete: Sometimes, things don’t go as planned, and you need to remove a widget from your dashboard. It’s ok, there won’t be any hard feelings. Just remember that once it’s gone, it’s gone forever. And it’s going to take all its history with it, so don’t make a rash decision. Now that you’ve conquered the Editor mode, click on the eye icon, on the top-right corner of the screen. Time to explore the Viewer mode! How to use the dashboard manager? How to use the Viewer mode?